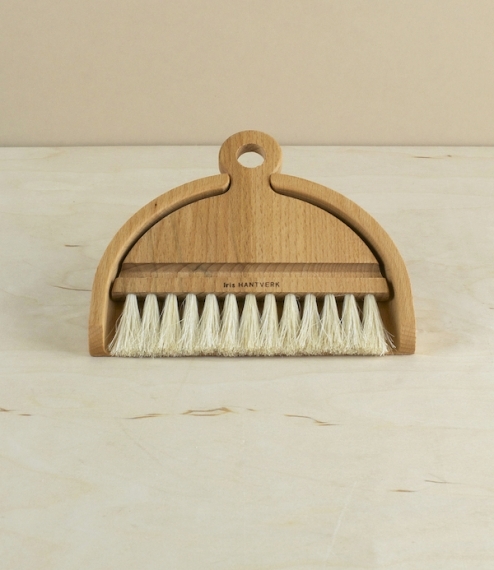 A small oiled beech and horsehair dustpan and brush set designed for sweeping crumbs from the table. The brush fits neatly inside the pan, in a manner somewhat akin to a jigsaw, and has in its handle a hole from which both will hang. Beautifully made in the workshops of Iris Hantverk, Sweden, where visually impaired craftsmen have been hand making brushes since the late 1800's. Measures approximately 14cm wide, by 12cm high, by 1.8cm deep.